Sherman & Howard – Artworks PHX – a business-arts campaign in Phoenix, Arizona USA. Sharing the arts with clients and the community. At Sherman & Howard we have been strong supporters of the arts in our local community, each of us in the areas we find personally enlightening, individually supporting museums, galleries, performing arts, and the like. As a firm, Sherman & Howard has a history of hosting clients and friends at events designed to show our appreciation of them and develop stronger relationships. A few ye ars ago, we combined the two, our interests in the arts with our desire collectively to socialize with clients and friends. The result has been a very successful series of functions uniquely designed for socializing around the arts. 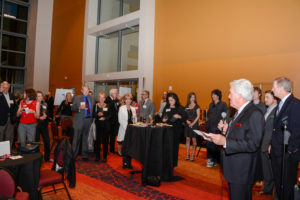 For example, this year Sherman & Howard lawyers and their guests joined with the arts program publisher, ON Media and its guests, for a joint reception during the Phoenix Symphony’s production of “Beatlemania.” The event was a huge success on many levels. Invited gues ts socialized with their hosts and got to know one another better during a happy hour of drinks and hors d’oeuvres, while the most daring photogenic souls donned 60s props and posed for photographs before a banner depicting the Beatles’ Abbey Road album. The Beatlemania musicians, who were almost dead ringers for their original counterparts, joined the party and mingled. Happy hour was followed by a fine musical performance, with several encores enjoyed by all. “The positive reviews on the evening speak to the benefits of forming relationships around the arts. Receptions become even more memorable when musicians, artists, or the director visit and give thanks for our patronage. Our valued guests leave with an unparalleled arts experience that serves as a conductor for a stronger business relationship. At Sherman & Howard, we are proud to support the arts as we build our business,” said Greg Falls, managing member of the firm’s Arizona offices. Sherman & Howard’s support for the arts flows out of both Arizona offices. Bryan Albue is the president of Jazz in Arizona, owner of The Nash, located in the “soul” of downtown Phoenix. Jazz in Arizona provides scholarships and supports music education for underprivileged youth. Hope Leibsohn serves on the Development Committee for the Scottsdale Arts Board of Trustees, whose goal is to be a pre-eminent arts destination and community asset that embraces world-class excellence and innovation in the arts. 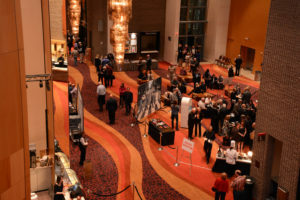 Scottsdale Arts offers a variety of programs through Scottsdale Center for the Performing Arts, Scottsdale Museum of Contemporary Art, and Scottsdale Public Art.